Liabilities of corporate defined benefit plans of S&P 1500 firms rise, as those of FTSE350 fall. 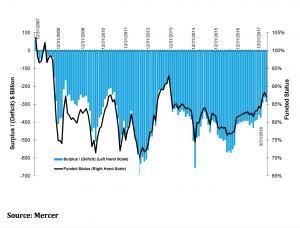 US and UK corporate pension deficits are moving in opposite directions as American funds increased their liabilities in March, while British funds have shed theirs so far this year, according to consulting firm Mercer. Due to losses in the equity markets, the estimated aggregate deficit of pension plans sponsored by S&P 1500 companies was $286 billion at the end of March, a $24 billion increase from $262 billion at the end of February, Mercer reported. As a result, the estimated aggregate funding status fell 1% in March to 87%. During the month, the S&P 500 index decreased 2.7%, and the MSCI EAFE index, which tracks the equity market performance of developed markets outside of the US and Canada, decreased 2.2%. Meanwhile, typical discount rates for pension plans as measured by the Mercer Yield Curve decreased by 5 basis points to 3.92%. Mercer estimates the aggregate funded status position of plans sponsored by S&P 1500 companies based on each company’s latest available year-end statement, and by projections to March 31 in line with financial indices. The estimates include US domestic qualified and non-qualified plans, along with all non-domestic plans. The estimated aggregate value of the pension plan assets as of the end of February was $1.97 trillion, compared with estimated aggregate liabilities of $2.23 trillion. When accounting for changes in financial markets through March 31, changes to the S&P 1500 constituents, and newly released financial disclosures, the estimated aggregate assets were $1.95 trillion at the end of March, compared with liabilities of $2.23 trillion. While the pension deficits rise in the US, the story is different on the other side of the Atlantic, as Mercer also reported that the deficit of defined benefit pensions for the UK’s 350 largest listed companies declined sharply during the first three months of the year, falling by £4 billion to £72 billion ($101.5 billion). The continued drop in accounting deficit was attributed to a reduction of pension liabilities, as a result of rising corporate bond yields, which has outpaced a drop in asset valuations. Liabilities have fallen £19 billion to £838 billion, while asset valuations have lost £15 billion to £766 billion in the first quarter of 2018. Mercer said its data relates to about 50% of all UK pension scheme liabilities and analyses pension deficits calculated using the same approach companies have to use for their corporate accounts. The data underlying the survey is refreshed as companies report their year-end accounts.